Harry has been in the UK since 2008 when he began training as an actor. He graduated a year ago and has no plans to leave at the moment. He uses the stage name Harry August which is easier for English people to pronounce. He has worked in various short film projects, as an extra in a feature film (“great experience but I won’t do that again”, he says) and various theatre and installation work. Harry also works in the catering business and teaches children circus skills and acting. He loves music and sings, plays guitar and bass; and hopes to have a band up and running by the end of the year. He loves London and doesn’t really miss Iceland, apart from his friends and family there and the nature, though he tries to go back at least once a year. Harry’s lopapeysa was knitted for him by his grandmother 4 years ago and he says it is an absolute life saver in the UK, claiming it gets even colder here in the winter than it does in Iceland (something I find hard to believe)! 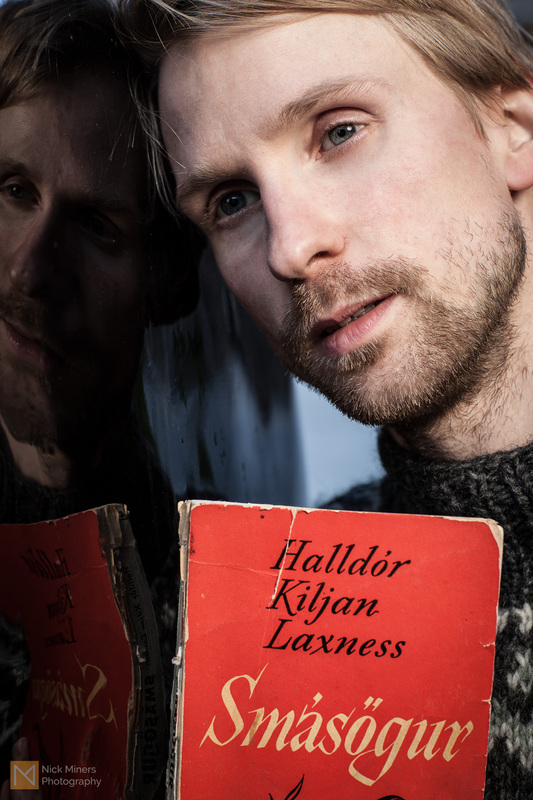 The book of short stories is by Halldór Laxness, one of Iceland’s greatest authors, but it’s not the content of the book that is of value to Harry so much as the fact that his parents lent it to him last time he visited them, and it reminds him of them. He also thinks it’s a beautiful old, worn book.